New book, 426 pages. On 1 November 2006, Alexander Litvinenko, a former KGB officer, sipped tea in the upmarket Millenuim Mayfair Hotel near the American Embassy in London - tea that had been spiked with a rare radioactive isotope called polonium-210. Twenty two days later, he was dead. The story behind his murder would be revealed as more baffling and labryinthine that any John Le Carre plot. 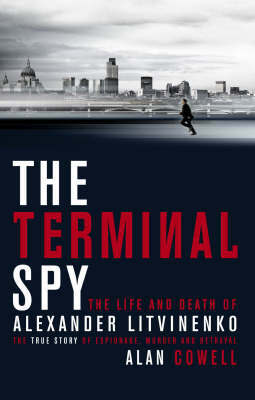 Blending the pace of a thriller with original reportage and research, the Terminal Spy documents Litvinenko's life and death, the ensuing police investigation, the reaction from Vladimir Putin and others in Moscow, the Russian emigre set in London, and the implications of this case for nuclear prolification and international terrorism in the future. It is a shocking indictment of how contemptuous of the rule of law certain governments are and a chilling reminder of the power - in evert respect - of the New Russia.